There’s a King Arthur movie out there with a cast that includes Kate Winslet and Daniel Craig. However, neither of them are the stars, and the lead fights evil with a Discman. Twice. Welcome to A Kid in King Arthur’s Court, the dumbest Arthurian legend ever told. 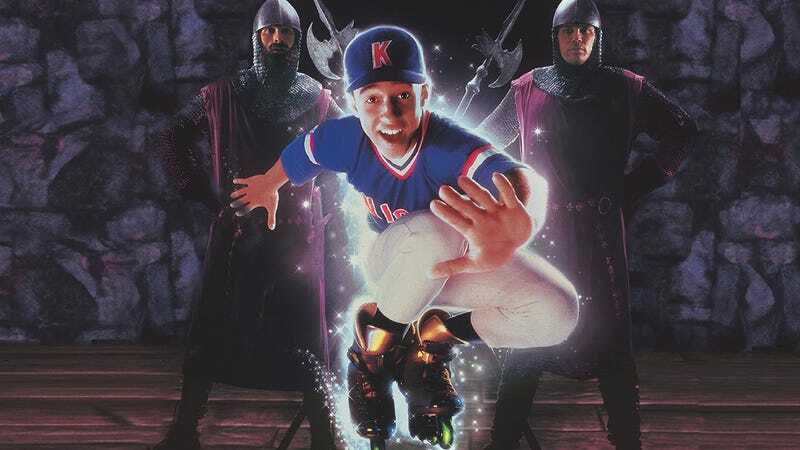 A Kid in King Arthur’s Court was released by Disney in the summer of 1995, starring Thomas Ian Nicholas as Calvin, a young boy who is bad at baseball. He’s basically the same character from the hit movie the actor starred in just two years prior, Rookie of the Year; this time, though, instead of hurting his arm and becoming good at baseball, he falls down a crack in the Earth and ends up in Camelot. Nicholas’ hair is one of the best parts of the movie. Here he is with Princess Katie. The reason Calvin falls into medieval England is because he’s essentially been kidnapped by Merlin—seen as a head in a well in this interpretation of the legends—who has summoned a savior to help King Arthur (played by Mighty Ducks mentor Joss Ackland) keep his kingdom out of the evil hand of the evil Lord Belasco (True Lies’ Art Malik). Belasco also evilly wants Arthur’s daughter Sarah’s hand in marriage and Sarah is played by none other than Kate Winslet, making an inexplicable career choice during a time in which she also made Heavenly Creatures, Sense and Sensibility, and Titanic. Of course, Sarah does not care for Belasco, but instead loves Camelot’s combat trainer Kane, played by Daniel Craig. It was one of his first major movie roles and he sports a haircut so bad it seems impossible that he would have ever been selected to play James Bond. Winslet and Craig. No, I wasn’t lying. If you’re wondering what a romance between Kate Winslet and Daniel Craig needs a kid involved for, the answer is nothing, really. Their relationship is kind of the C-story of the movie. The main story is about Calvin trying to get home to California by helping King Arthur and saving Camelot from Belasco. In the B-story, he falls in love with Arthur’s younger daughter Katie (Paloma Baeza). The truth of the matter, though, is that those storylines are kind of stupid. The fact that Kate Winslet and Daniel Craig are in A Kid in King Arthur’s Court is by far the most interesting thing about it 22 years since its release. The main story is bland and underdeveloped. We never understand why Arthur has become so weak, he never understands it either, and when Calvin does help him, it’s mostly with wisecracks and a Swiss Army knife. Calvin supposedly trains to become a knight, but really he just falls off a horse a lot. Also, he wears his obnoxious Knights baseball jersey for most of the movie. Yes, I called the jersey obnoxious. It doesn’t help that every action scene in A Kid in King Arthur’s Court looks like it was filmed in slow-motion, either. You almost get the sense there wasn’t enough of a budget to hire a lot of stunt actors, so instead the lead actors were forced to perform all the action. As a result, the actors moved all their swords very slowly and very safely. Calling it “boring” doesn’t do it justice. When not holding a sword in the air and waiting for someone else to hit it, Calvin harnesses the power of the ‘90s. At one point, he fights using the power of rock and roll (he plugs his Discman into a horn) and later, he shoots the laser from the Discman into someone’s eyes. Yes, the Discman does more to save Camelot than Calvin. Calvin also has a Camelot carpenter make rollerblades so he and Katie can skate together, and later the same guy makes him a mountain bike so they can go on a picnic. I mention those things because, again, they’re dumb ‘90s things and still more entertaining than the onscreen story. A Kid in King Arthur’s Court was released in what was a bit of a murky period for Disney. The best of their ‘90s animation was over, their popular live-action franchises had peaked, and some small company named Pixar was about to release a movie made by a computer a few months later. So Disney survived this flop, just as Daniel Craig somehow survived his hair. A Kid In King Arthur’s Court is currently on HBO Go if you are a glutton for punishment.